On the last day of the Fall intensive class for all incoming Sterling students, “A Sense of Place,” students were invited to a ceremony where they were bestowed the Snow & Nealley axe that they would use in the Tools and Their Application class that would start the following Monday, and, with good stewardship, throughout their entire Sterling careers. 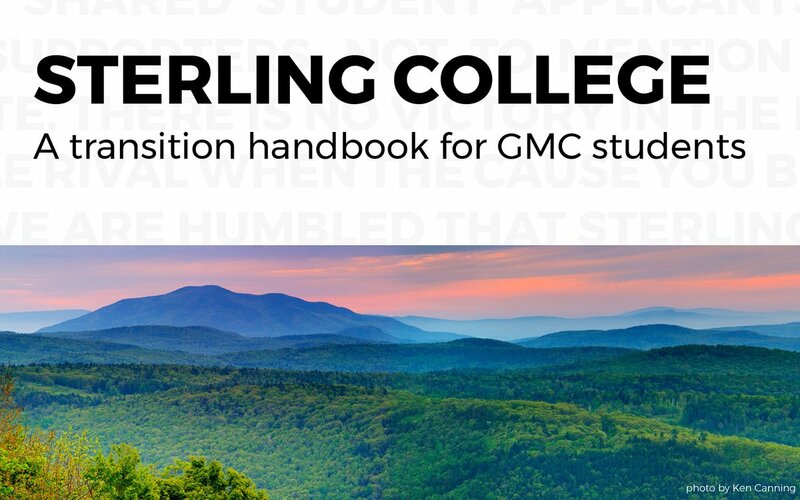 Students who are accepted to Sterling College receive an axe file with their acceptance letter. These axes are the next stage of their Sterling journey. In the Houston House gardens, President Matthew Derr held aloft an axe presented to him by alumnus Alan Martin ’66. Martin was given the axe upon his graduation from Sterling School, along with a copy of Stalking the Wild Asparagus, and Derr keeps both in his office on campus. Faculty in Outdoor Education John Zaber congratulated the incoming students on completing their journey through “A Sense of Place.” Fellow faculty in Outdoor Education Adrian Owens talked about what the upcoming Tools class would be like, and how taking the Tools class linked generations of Sterling alumni. He displayed his family’s axe, which, as he noted wryly, has had “two different heads and two different handles.” Faculty in Sustainable Agriculture Rick Thomas and students Ezra Fradkin ’15, Reesey Partlow ’16, and Matthew McClenahan ’16 read the poem “Axe Handles,” by Gary Snyder. “I am an axe/And my son a handle, soon/To be shaping again,” they recited. Owens reminded students to treat their axes as they would themselves, and that the axes are a reminder to stay sharp, take care, and be safe during their time at Sterling.